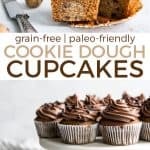 Grain Free STUFFED COOKIE DOUGH Cupcakes! 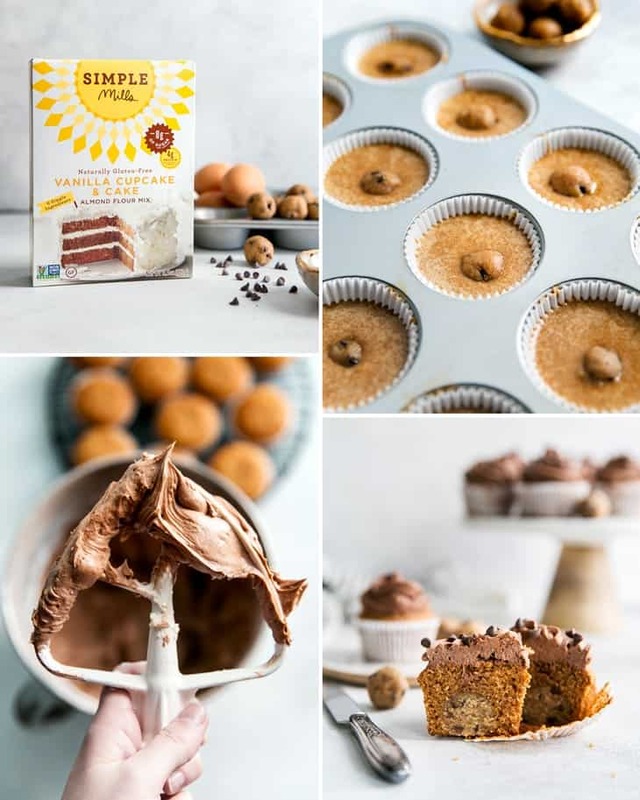 Using Simple Mills Vanilla Cupcake & Cake Mix making these cupcakes quick and easy, as well as paleo-friendly! This post is sponsored in partnership with Simple Mills. As always, all thoughts and opinions expressed are my own. 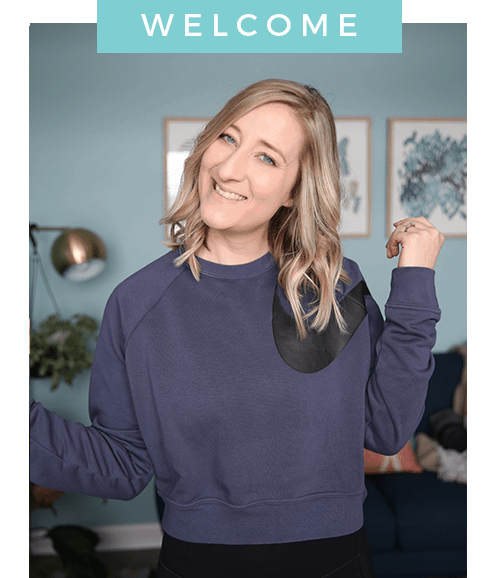 Thank you for supporting Fit Mitten Kitchen and the brands that help me bring you new recipes! So have you ever stuffed cookie dough INSIDE of cupcakes? Because it’s pretty much amazing. To be honest I don’t actually make cupcakes a ton. Mainly because I find them intimidating. Which may sound silly to some because I make a lot of muffins… but muffins and cupcakes are very different. Cupcakes should be… well, like cake! (Duh.) Whereas muffins are more like a quick bread recipe – not as sweet, more dense and often more forgiving in ratios of ingredients. 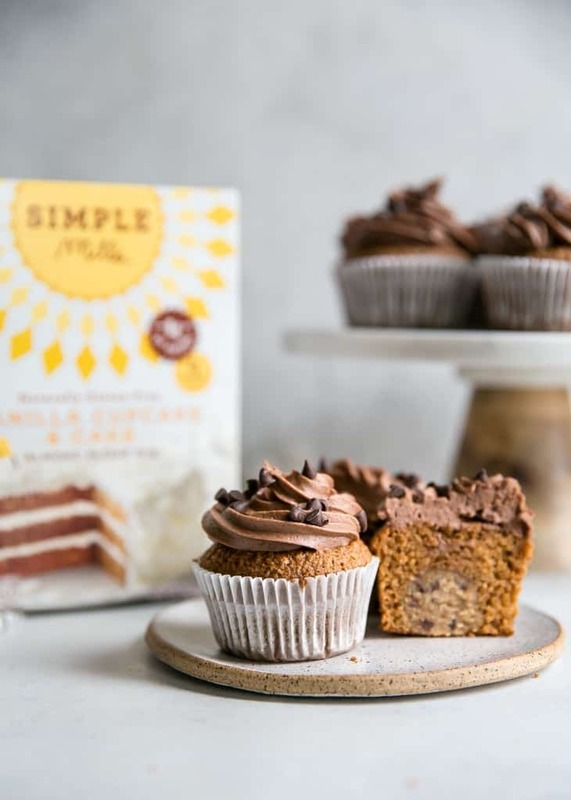 Thankfully when it comes to cupcakes and grain-free baking, Simple Mills can make your next baking session a breeze. In light of Galentine’s Day coming up (February 13th!) my friend Andrea and I had a little get together. Andrea actually hosted because she has the most adorable house ever and said she loves having people over. We’re both introverts too, so sometimes it’s good to have an excuse to get your friends together and make an afternoon of it! 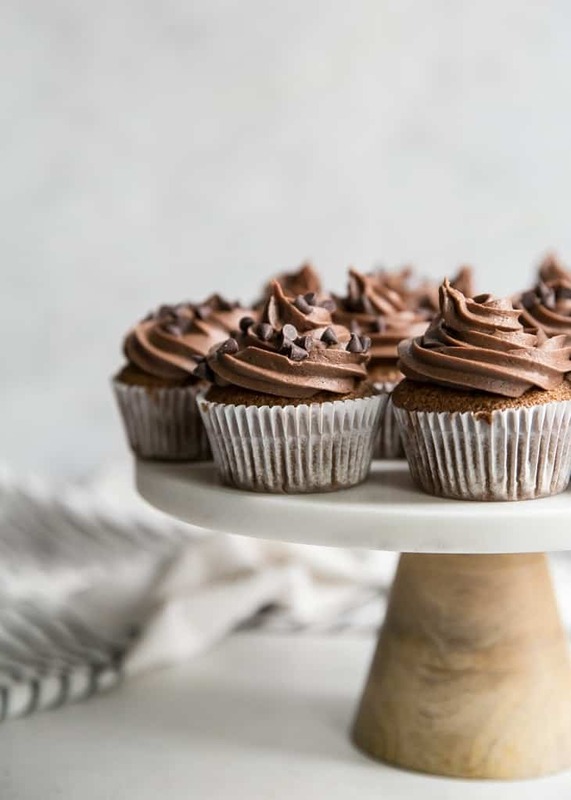 To make things super simple, I baked the Simple Mills cupcakes beforehand and brought them over on the day of the party along with Simple Mills frosting and sprinkles for decorating. We enjoyed mimosas, coffee, brunch food and of course CUPCAKES while chatting about early spring travel plans. Michiganders often like to go somewhere warm mid-winter to break up the long season of gray skies. 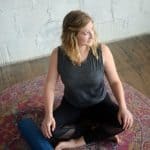 If you live in the Midwest or East Coast and struggle with getting in activities during the winter, it can be really helpful to schedule time and get togethers with friends. 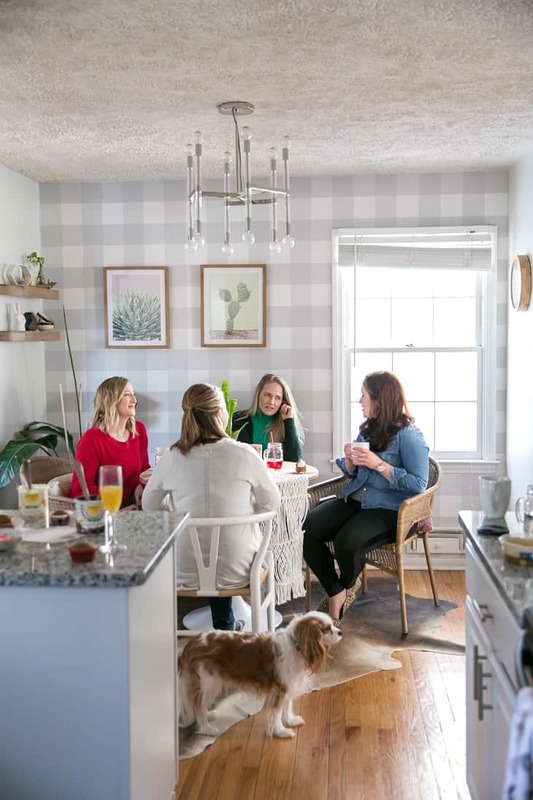 It’s easy to stay inside in the warmth of your own home all season long but making plans for fun get togethers makes the long winter so much more bearable. Not to mention the fact that a lot of us are on our phones a lot these days, and can easily live in an alternate universe. So planning real life, face-to-face interaction can be rejuvenating for the soul. Plus, who doesn’t love cupcakes!? 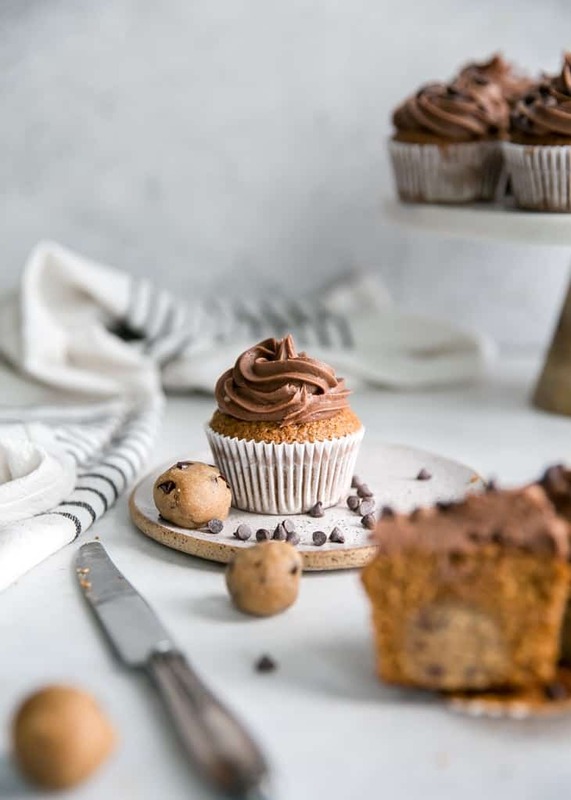 These cookie dough cupcakes are perfect for any occasion – the office, celebrating friends, birthdays or just a weekend baking session. And because we’re using Simple Mills cake mix, no need to gather tons of additional flours. 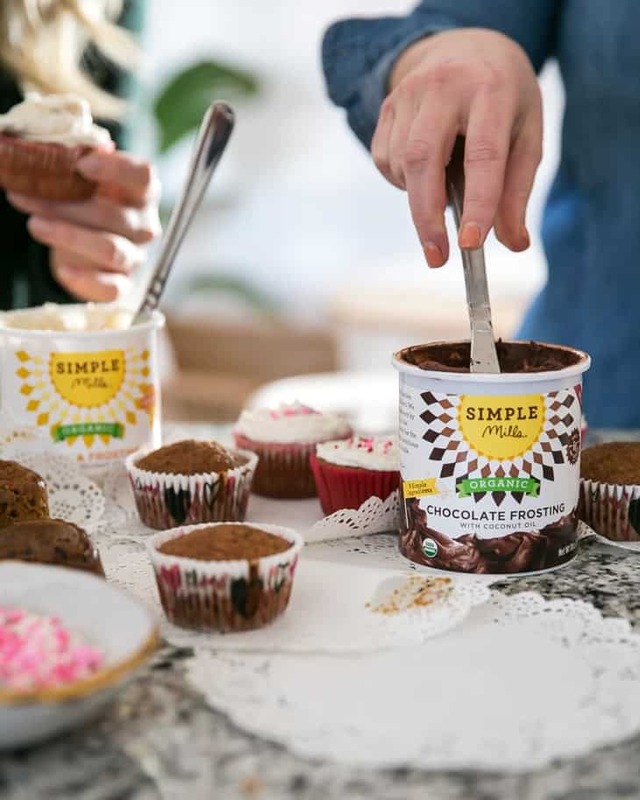 Simple Mills uses real-food ingredients and nothing artificial. Chances are when you read through the ingredients list on any Simple Mills product, you’re going to actually recognize everything on the list. First make the Paleo Cookie Dough Truffles into 1 rounded teaspoon size balls. Place in fridge to chill for 20 minutes while you prep the cupcake batter. Prepare the cupcake batter and follow the directions on the box – You just need 3 eggs, 1/3 cup oil, 1/4 cup water and vanilla extract. The batter may seem really wet and thin – this is okay. But if you’re concerned and have coconut flour on hand, you can add an additional tablespoon. I did this while testing a batch and it was fine. Pour the batter into a lined cupcake tin, evenly distributing between 12 cups. The batter should be 2/3 full (as directed on box) in each cup. Then place the chilled cookie dough in the center of each cup. Watch your baking time after 14 minutes. Mine took just 16 minutes but every oven is different. Make sure the cupcakes are completely cool before frosting! 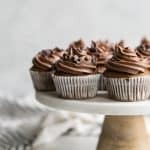 I share a recipe for paleo friendly frosting below or you can use Simple Mills Chocolate Frosting. This recipe is pretty simple and worked out great for piping. I allowed the homemade frosting to set up in the fridge for about 20 minutes (about how long the cupcakes should cool) which gave the frosting some structure while squeezing through the piping bag and piping tip. 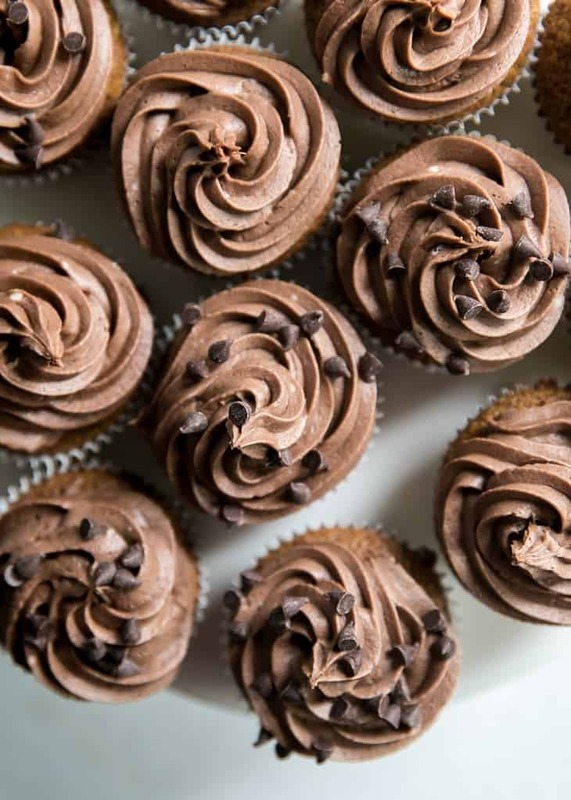 Top with mini chocolate chips and you’ve got yourself beautiful cookie dough cupcakes. Leave a comment and review if you make this recipe! I love hearing from you and seeing what you’ve made, and it helps others learn more about the recipe too! When’s the last time you had your girlfriend’s over? 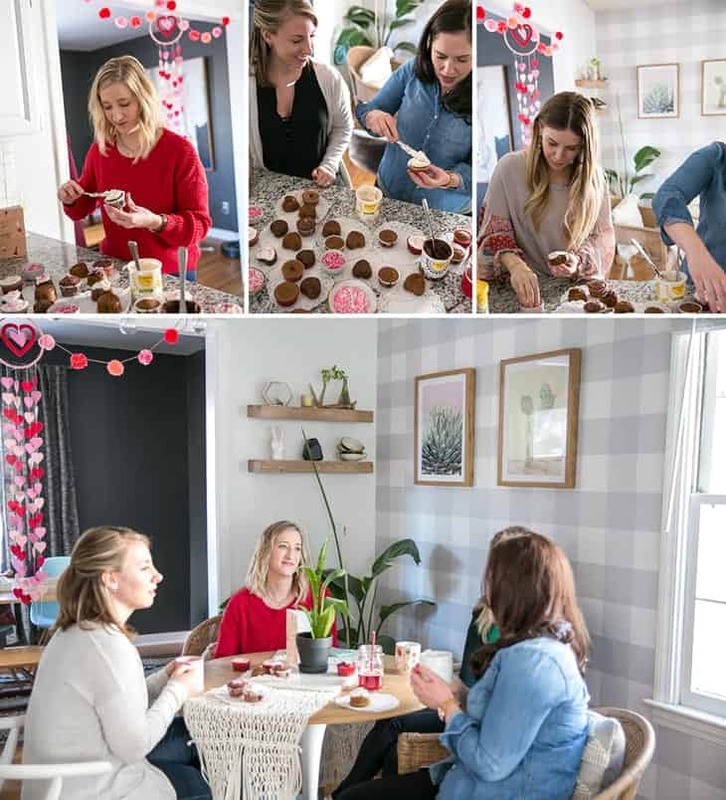 Galentine’s Day or not, it’s always a good time to celebrate your closest friends and enjoy some cupcakes, good food and company. Even though I’m not single this Valentine’s Day, I definitely love a great date with myself. In fact, I went downtown by myself and enjoyed a decadent vegan brownie cookie and slice of vegan and gluten free apple rum cake. It was the BEST outing ever! I bet that your Galentine’s Day party was a ball–nothing beats time with the girls! 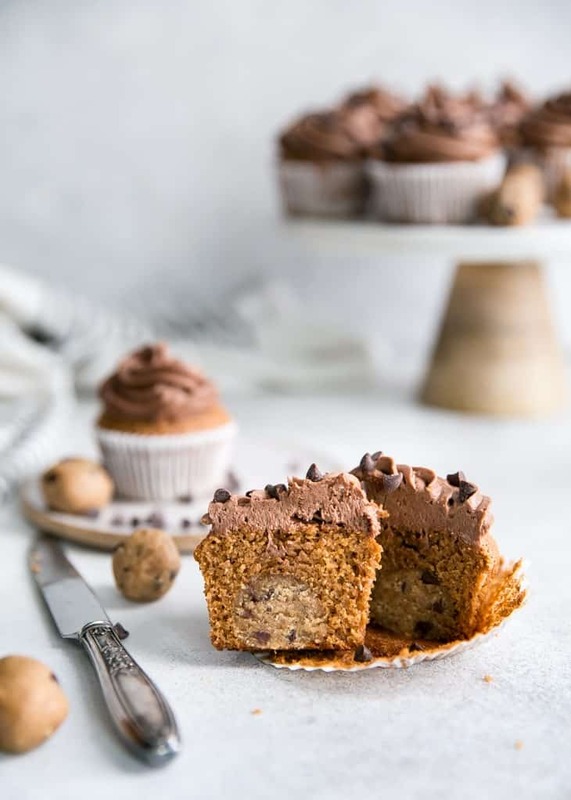 These cookie dough cupcakes look freaking superb too! Nothing can trump the combination of cookie dough and chocolate!